Remember the old SNL skit "Samurai Deli" with the late John Belushi? Well forget about that. The Sengoku Style Cafe & Bar Mononopu has a much more pleasant staff who won't go all Banzai on your keester if you dare to complain about the portion size. Mind you, they still carry swords so watch your step - and leave a good tip. "Sengoku" refers to the centuries-long "Warring Era" during which powerful warlords ruled their provinces with iron fists, and in their spare time smashed those iron fists down upon the heads of their neighboring warlords. The final victory of Tokugawa Ieyasu in 1603 put an end to the Warring Era but the legends of the warlords and those who lived and died in their service still linger. Anyway, enough history, back to the maids! 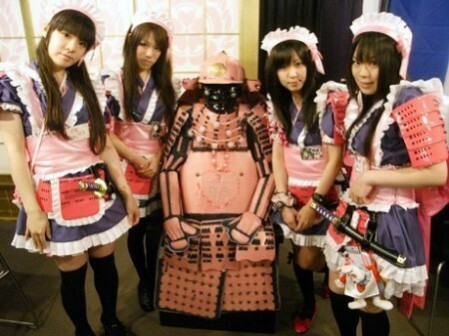 The Sengoku Style Cafe & Bar Mononopu is located in Tokyo (of course) near Akihabara station (even more of course), and it would appear to be a paradise for those who love both Japanese history and Japanese girls dressed as maids - and really, who doesn't?